Call Us For Help With a Slab Leak. Getting hit by a slab leak is something nobody ever wants to experience. This can cause major issues with your home and be a start to a lot of damage down the road. When you start to see the signs of a slab leak, you should call a plumber out right away to start the process of finding where it is coming from. A slab leak is something that happens when one or several of the water lines under your home’s slab, become damaged and begin to build up water that will eventually leak into your home. Here at All About Plumbing & Septic, we are serious about slab leaks and the process in which we repair them. We understand the major inconvenience that this may cause you and we are always dedicated to making sure that we handle it as quickly and efficiently as possible. Slab leaks used to take a very long time to find and because of that, were expensive. We not only have the latest technology that allows us to find leaks faster than ever before, we also have experienced plumbers that have years of knowledge when it comes to slab leaks in homes and businesses. We used heat detection radar to find out the area that the leak is coming from, and then we use camera inspection to find the exact source of the leak. This allows us to see what is happening right in front of our faces and then come up with an effective plan to fix it. We always try our best to give you options of different ways that we can approach the slab leak. Some will be more expensive and some will be cheaper, but we will never give you any option that you do not need to have. We are here to help you and keep the prices as low as we can because we understand the process of a slab leak and how stressful it can be. Below, are a few different ways to know if you have a slab leak in Mills River, Hendersonville, and Asheville, NC. Give us a call at 828-778-2425 to set up an appointment today. Water Bill – If you suddenly realize that your water bill is skyrocketing, you will almost always find that you have a leak somewhere. This is often one of the first things that people will realize before they discover that they have some kind of leak. Water Meter – If you think you have a leak and want to find out for sure, there is a way you can do that on your own. Take a look at your water meter and write down the number that you see it is on. Make sure everything in your home is turned off. That means don’t flush any toilets or do any laundry; we usually recommend leaving the house for a few hours to avoid any of this. When you come back to your home a few hours later, you will then go to your water meter and see if the number has increased. If it has, you have a leak somewhere. 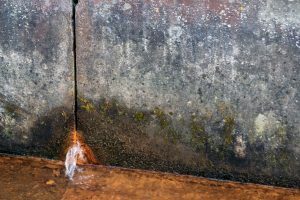 Noise – If you keep hearing the noise of running water and cannot pinpoint where it is coming from, it could be because it is coming from under your slab. If you lay on your floor and can hear water underneath it, call a plumber right away. You should never be able to hear water under your floor. Hot Floor – Have you noticed that certain parts of your floor have been hotter than others? This means that water is leaking in that specific spot and is why you are feeling heat on the floor. If you start seeing your floor lifting up or warping in any way, that could be from water damage that is coming up from under your home or business. Slab Leaks Can Cause Damage To Your Home. You can prevent a slab leak by getting gutters on your home. This will allow water to get placed away from your home and will not cause the ground to get too wet. If the ground is constantly to wet from rainwater, it can cause your foundation to shift and damage the plumbing underneath the home. You can also make sure that your water pressure is not too high. 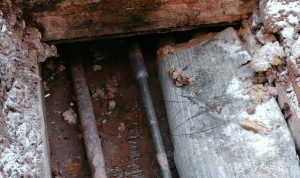 Over time this can cause damage to your underground pipes and stir up a leak somewhere that you may not know about. If it turns out that you do think you have a slab leak in Mills River, Hendersonville, and Asheville, NC, call us at 828-778-2425. At All About Plumbing & Septic, we are leaders in slab leak repair and will be able to help you with anything you might need. If you have questions, all you need to do is call us and we will do everything we can to help you over the phone. Slab leaks can be scary, but when you have us on your side, you will always be okay. Updated on January 21, 2019 at 5:41 pm by All About Plumbing.